Go North East Engineering Storekeeper, Emilia Fengriffen. To celebrate the start of Wimbledon tennis tournament, we have a ballsy competition for you. 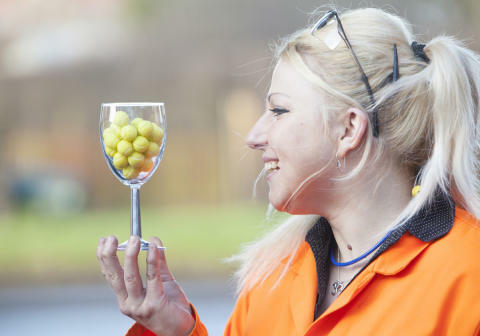 Don’t make a ‘racquet’ about it, just simply tell us how many balls are in this glass. For the person who guesses the correct number of balls, or the closest number, it’s Game, Set and Match! Now, get your eyeballs on the balls, head to Facebook or Twitter and give us your best guess! One entry per person, per social media channel. Closing date for entries is 11.59pm on Sunday 10 July. Entries can be made only by commenting on the competition Facebook post or by retweeting the competition tweet, and replying with your guess. If more than one person guesses the correct number of balls or there are multiple guesses that are equally as close to the correct number then these entries will be put into a draw and a winner chosen at random.